I had to work today, but not until 1:00pm, so after getting some writing done in the morning. I hopped on the bike in sunny, almost 50-degree weather and zipped down the hill for a quick swim. I make this same ride so often–it’s like the two miles on St. Charles I used to pedal every day. I did my few laps and then raced back up the hill–1:00 comes fast when it’s a lovely day like today, and I was running late. As I made my way up Fallsway I made myself slow down enough to look around and appreciate the scene. I stopped to snap this picture at Chase, looking east to Barclay. There used to be a big pile of dirt in the foreground, but it got slowly moved across the street, replacing the row houses that were being torn down to make room for a new park. A couple weeks ago they started to get the red house ready for demolition, and the white one wore a couple strands of Christmas lights. The red one is getting closer to getting knocked down today, but it’s still there. D. walks her dog in this neighborhood, and she told me the woman in the white house refuses to sell. This might look like an abandoned block, but it’s not–she lives there, and she wants to stay. So she’s staying, and now she’ll live next to a park. I hope she enjoys it, and I hope D. keeps walking her dog over there and getting to know that neighbor across the way. I pledge to keep riding my bike by it, day after day after day, eyes open. 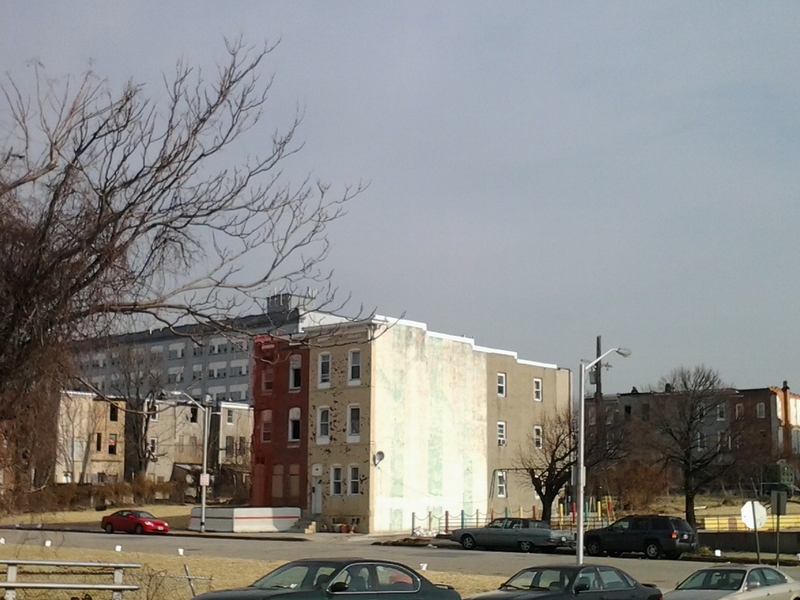 This entry was posted in blight, houses, parks and tagged Baltimore, blight, city parks, East Baltimore, Harbor East. Bookmark the permalink. It’s her home. She wants to stay.